Two days after scoring his 250th Serie A goal, Francesco Totti has turned 40, marking what we can only hope is the halfway point of his career. Naturally, a great many tributes have rolled in to mark the occasion, so let’s take a look at some of the best. 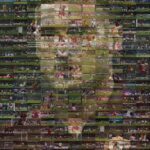 Panini put together a great video compiling a timeline of Totti’s stickers and achievements through the years, showing two decades of popular footballer hairstyles.
? 25 seasons, 25 Panini sticker images (and a few with the @Azzurri as well). Luis Figo apologized for “stealing” the Ballon d’Or from Totti in 2000, saying “you deserved it” with a cheeky grin. Gli auguri di @LuisFigo per il #Capitano! ?? Andrea Pirlo delivered the coolest birthday wishes, saying, “I see that you are still able to score goals and have a great time and I think that’s the most important thing” as he lounged on his couch, topping off his message with Totti’s famous goal celebration. Alessandro Del Piero posted a great video of him and Totti cracking up during a commercial shoot back in the day. And finally, Roma president James Pallotta seems to think Totti is 50. 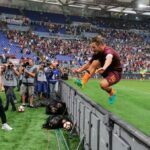 But he can just save this video for when Totti is still playing for Roma in 10 years.